So if you don't know already, I am currently in my second year of University, and I have to say my first year was very similar to my college course. But, aren't I learning a higher level? Shouldn't it be more difficult? University was a very rushed thing for me. I was in college and it was time to apply for Uni and I was pretty certain I wanted to be a psychologist so I was able to help others in the future who suffer from bullying just like I did. I wasn't given the support I needed and I wanted to try and make a difference. After going back to the primary school where I learnt for a third of my life so far, I decided working with children was where I needed to be and where I wanted to go next. 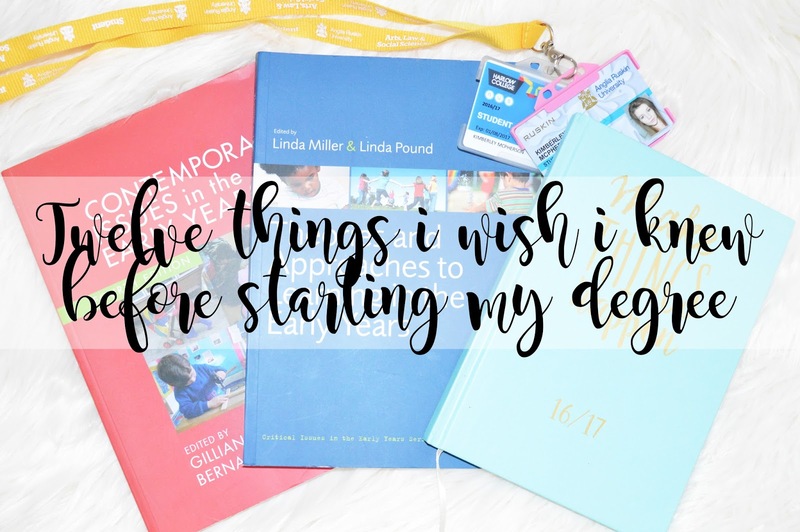 I decided after volunteering in schools for two years, it was time to actually make a change and study to become a primary school teacher, so at the last minute I changed my UCAS application, without even changing my personal statement. I wish I knew more about university before I went, and I feel like if someone handed me all of this information which I'm about to hand you, I would have probably thought more about University and whether it was actually worth it. Although I already knew this both in school and college, I thought it would be different in University. I thought everyone would get along as they're all paying to be in the same place and they clearly have similar interests! I was so wrong! Although I have made friends while being at University, there are some strong characters too and ones which I really clash with! It's okay not to make friends with certain people and it's completely normal too! Although failing a module can be a real biggie, it isn't! I personally haven't failed a module however I have learnt that you can resubmit a module if you do fail it which I think is absolutely great seeing as you are paying a lot of money to study and learn at University. Why shouldn't you be able to resubmit? However, to pass a module you need to have more than 40% which is easy, you can all do it! It's okay to have second thoughts while you're doing your degree and I'm sure many people do! Just because you're paying a lot of money to be studying at University, doesn't mean you have to be there! Although you might have second thoughts and may end up leaving University before you finish your degree, you can still come out with potentially a level 4 or 5, which is always better than a level 3 so it's okay! University isn't a place where you will be judged on what you wear. If you want to come in wearing a tracksuit, this is completely fine! If you want to come in wearing your favourite outfit, this is also fine! There are so many different styles these days, no one will care about what you wear. I personally will always choose simplicity and comfort because when I'm comfortable, I'm happy! One great thing about my University is how we all have a matching hoodie but with our name on, so we all simply turn up wearing these so we're warm, comfortable and we can't be judged either! Obviously it's not as simple as this, as you do need to actually submit your work too, to a reasonably high standard, However, the easiest way to get a good grade is your attendance! If you're attendance is rubbish, you're highly unlikely going to get a good grade when your lecturers can see you're not really interested or bothered in what you're learning about or where you want to go from University. I have learnt from being a student at University, the lecturers do make the choice on your score, not based on how well you wrote, but based on what they want to give you, so it then shows improvement in your scores through the coming few years. I heard so many stories how students never saw their lecturers to ask for help. However, being in a small university centre, I find my lecturers can be useful when they want to be. If I send an email to one of my lecturers, she will always reply straight away. If I send an email to a different lecturer, it will take her a good three to four days to reply, but her answer will always be in-depth and very helpful, or at least she tries to be helpful! If you need help, ask for it! They're not there to see you struggle. You will receive a huge reading list of books they want you to read, buy or use and they always tell to you to buy them brand new from Amazon! Do not do this. Firstly, look in your library at University, they will always have a large selection of books. If you cannot find certain books, then head on over to ebay or other small book companies on Google where you will be able to find your books for a very small amount! I managed to pick up over 30 books for less than £30 which is absolutely brilliant as a student with not a lot of money! I then went over to the library and picked up a further 18 which I knew I couldn't get online without paying £20+. Don't pay the RRP, it'll cost you a fortune! It's normal, we all struggle with deadlines, especially if your lecturers are as unorganised as mine are! They will set you a piece of work to do for a couple of days time, and it will be something which takes a good week to prepare and complete. Time management is so important when studying a degree and although I'm very good with time keeping and studying, I really wish I knew this before starting my degree so I would be more prepared! However, the first year doesn't count so it does help you to prepare for your second year. So, it's as simple as this. Everyone hates group work, you are not the only one! Everyone is dreading working in a group with people they do not know, or people they do know who are pretty rubbish with being organised and time keeping! This is why universities make you do group work, to build on your weaknesses and help each other out! It's also a great way to build your team work skills because where ever you go, you will always have to work in a team. You don't have to like group work though and this is fine! I personally will always hate it. If you can go through university without feeling stressed, then you are an angel in disguise! Everyone will suffer from a moment of stress. They will suffer from this every day until they finish their degree, or they will suffer with it for only one project. Every person is different when it comes to their stress levels and how much work load they can cope with and you need to learn the strategies on coping with this but you will have your friends and lecturers to support you. Nobody cares. They do not care what you have for lunch, or where you had your eyelashes extended the other day or when you last washed your hair. They really don't care. So drop your expectations as no one is going to care about how you look or how you feel and you do not need to worry about this! It'll just stress you out even more which you really do not need! This one makes me smile and it is so true. No one has it all together. That girl over there who always does the homework and projects set. The one who seems like she has everything organised and her life is just as easy as pie. She hasn't got it together, she has been through moments of struggle just like you have, she just isn't showing it! Just because it seems like people find it easy, doesn't mean they actually are. Make sure you ask people if they're okay, or if they need any help with anything, they may actually say they need help and you wouldn't have thought it! Let me know of any things you wish you knew before starting University.